As you may have seen in the media, the One Center City process is well underway. One Center City aims to “bring together many communities, perspectives and partners, to create a 20-year plan for how we move through, connect to, and experience Seattle’s Center City neighborhoods.” As part of the One Center City process, Seattle Neighborhood Greenways and Cascade Bicycle Club are proposing a Basic Bike Network as an early implementation strategy. This interim strategy will allow the city to improve mobility and safety quickly, and collect data about how a connected network of safe places to bike downtown would work best. Join us at Seattle City Council, Tuesday April 3rd 2018 at 2 PM. 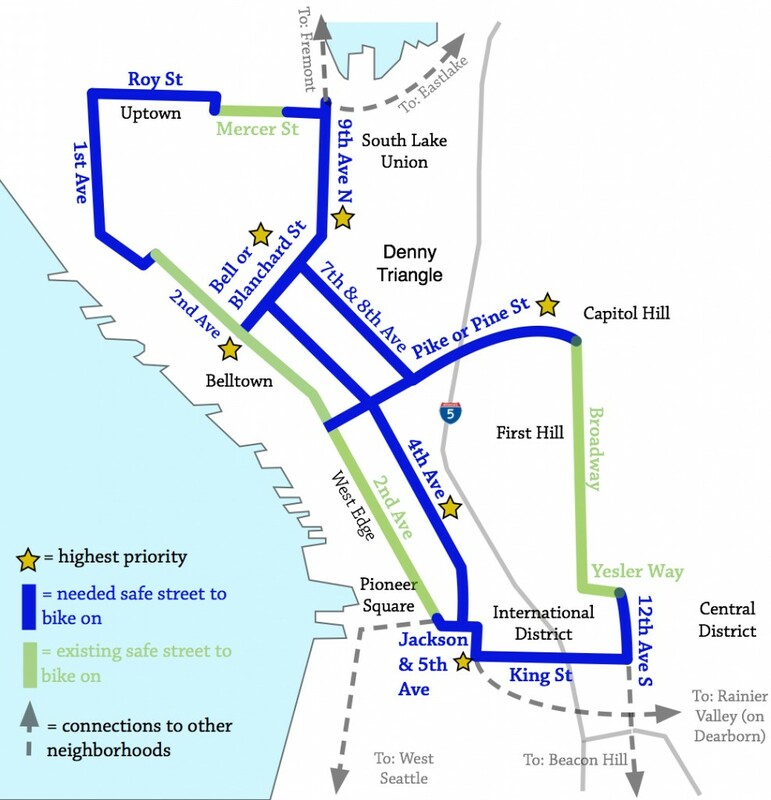 WHY A BASIC BIKE NETWORK? Our downtown streets are crowded and offer limited bike connections. A connected network of safe bicycle lanes is essential to efficiently move people. Bicycling is a reliable way to travel to, from and within downtown — even when transit is delayed. Implementing a basic bike network will provide more people with a failsafe mobility option. Calgary offers the best example of quickly implementing a basic bike network, setting realistic target metrics and collecting pre- and post data during an 18-month pilot. After the pilot, Calgary voted to make the network permanent. Edmonton is now following its approach, with other cities following closely behind. Other cities have demonstrated that a pilot network is a successful model: Seattle’s plan coupled with the comprehensive multimodal OCC process would truly make it a transportation leader amongst our peer cities.